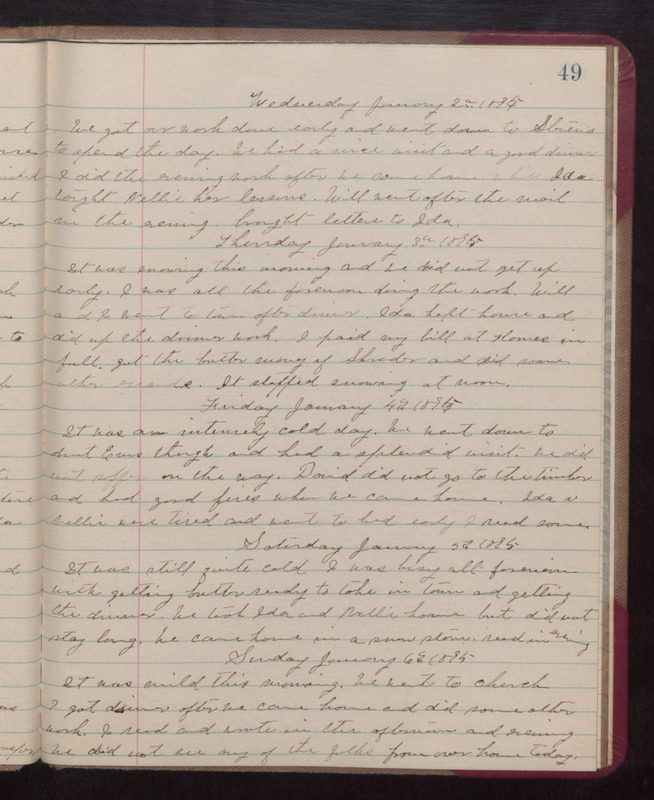 Wednesday January 2nd 1895 We got our work done early and went down to Stevens to spend the day. We had a nice visit and a good dinner. I did the evening work after we came home while Ida taught Nellie her lessons. Will went after the mail in the evening. brought letters to Ida. Thursday January 3rd 1895 It was snowing this morning and we did not get up early. I was all the forenoon doing the work. Will and I went to town after dinner. Ida kept house and did up the dinner work. I paid my bill at Homes in full. Got the butter money of Shrader and did some other errands. It stopped snowing at noon. Friday January 5th 1895 It was still quite cold. I was busy all forenoon with getting butter ready to take in town and getting the dinner. We took Ida and Nellie home but did not stay long. We came home in a snow storm. read in evening. Sunday January 6th 1895 It was mild this morning. We went to church. I got dinner after we came home and did some other work. I read and wrote in the afternoon and evening. We did not see any of the folks from over home today.